Mortise locks have been installed into residences and commercial buildings for more than 100 years. The basic concept of the mortise lock is a lock body that is installed into a mortised pocket within the lock edge of the door. This type of lock is concealed and to some degree protected by the exterior and interior faces of the door. The earliest mortise locks contained a built-in warded lock mechanism operated with a bit or barrel (skeleton) key. After the invention of the pin tumbler lock mechanism by Linus Yale Jr., pin tumbler mortise cylinders were incorporated into the mortise locks. Today’s mortise locks offer a higher degree of security and functionality. These locks accommodate just about every high security lock manufacturers’ mechanisms as long as they are incorporated into a standard diameter mortise cylinder or a Mogol mortise cylinder. From the late 19th to the mid-20th century, mortise locks were the preferred lock-set, installed into most interior and exterior doors. Mortise locks are available as a lock-set and as an auxiliary mortise deadbolt lock. Some interior doors might be equipped with a warded mortise lock and the exterior doors with a pin tumbler-operated mortise lock. Interest has been high recently in the use of mortise locks because of their customizable appearance. Architects have begun to specify mortise locks for commercial and more expensive residential properties. Since most North American mortise locks are designed to operate with a mortise cylinder, there is not the limitation that cylindrical locks have with different size lock cylinder bodies or different configuration removable/interchangeable cores. Nor is there the exposed lock body on the interior side of the door using a rim mounted lock-set. In addition, mortise locks can be customized to enhance the customer’s decorating goals. Mortise locks can be equipped with cast knobs and levers, placed onto ornate to modern escutcheons and trim of varying sizes and shapes. For example, a two-point locking mechanism consists of a mortise lock set and mortise auxiliary lock. Institutional mortise lock-sets used to control access in asylums and detention facilities require a higher level of security. In addition to heavy duty construction, institutional mortise locks can accept mogul style lock cylinders and anti-ligature knobs. Before mortise lock size standards (ANSI/BHMA) were enacted, lock manufacturers would design and manufacture their mortise locks in the size, configuration and applications to meet their individual requirements. This meant that one manufacturer’s mortise lock, for example, one model of a Challenger Mortise Lock door prep, was not necessarily interchangeable with another manufacturers’ mortise lock or even a different Challenger Mortise Lock without some modification. 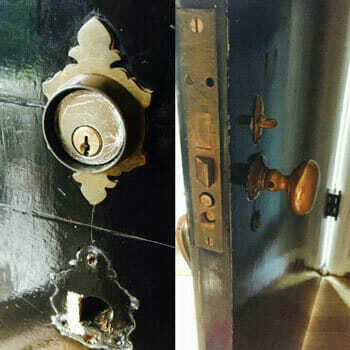 The differences could include the case (body) dimensions, the front dimensions, the location of the latch and the deadbolt, and the location of the mortise cylinders and knobs. This meant that once an end user installed in specific brand mortise lock-set, they were basically customers for at least the life of the door. Sometime, you could get lucky and find a replacement mortise lock manufacturer with door prep similar to the lock you were replacing and using large enough escutcheons would cover the existing door prep and painted or finished trim edges remaining from the replaced (in most instances, an out-of-business mortise lock manufacturer). Most brands of mortise locks are available electrified or existing mortise lock-sets can be electrified. Once a mortise lock has been electrified, it will still fit into the same door prep with the addition of a wire raceway. And as an added benefit, electrification of a mortise lock enables optional features including REX output, door status, and latched and locked status. Servicing a mortise lock is relatively easy as the body can be removed from the door and disassembled without manipulating the lock cylinder. If there is a problem, the customer will normally tell you what it is. Whether it is the latch will not retract from the interior or the deadbolt will not throw. 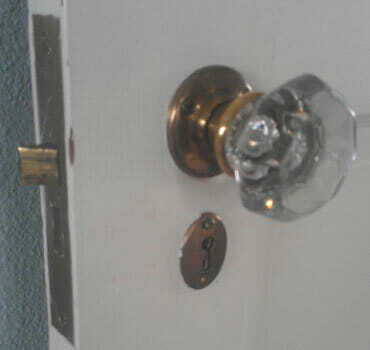 The first thing I do when servicing or repairing any lock is look at the door and the jamb, checking the gap. I then look at the floor to see if there is any evidence of dragging. I check to see if the door operates and the door closer, if equipped, is able to close the door and latch the lock. Once I am satisfied the door and jamb are in operating condition, I lightly lubricate the mortise cylinder key-way to make sure a key operates smoothly. Then I carefully operate the lock with the door open and closed. If the problem occurs only when the door is closed, check the door or strike alignment. If the problem discussed can be repeated, the solution can be determined. Note: Photograph the disassemble procedure using a digital camera to have photos as reference in case the lock body explodes or spring loaded parts fly during dis-assembly. Once you have a general idea of the problem, then remove the mortise lock body from the door. Behind the front, two setscrews secure the mortise cylinders or the inside thumb-turn. Loosening the setscrews permits the mortise cylinder and thumb-turn to be unscrewed. The interior knob or lever either has a setscrew or a threaded sleeve that must be loosened in order to remove the interior and exterior knobs or levers. If the mortise lock is through bolted, there usually is a spring cage on the interior side that must be removed in order to remove the exterior lever and spring cage. Older mortise locks can be equipped with a handle-set. The handle-set is usually removed by unscrewing the mounting screws on the interior side. Once the levers, handle-set or knobs and the mortise cylinder(s) and thumb-turn (if equipped) are removed, unscrew the two edge mounting screws and slide the lock body out of the door. With the internet full of lock manufacturers’ catalogs, installation instructions and parts manuals, always research the lock you are servicing before servicing. Manufacturers’ information can make the service straightforward and easy. 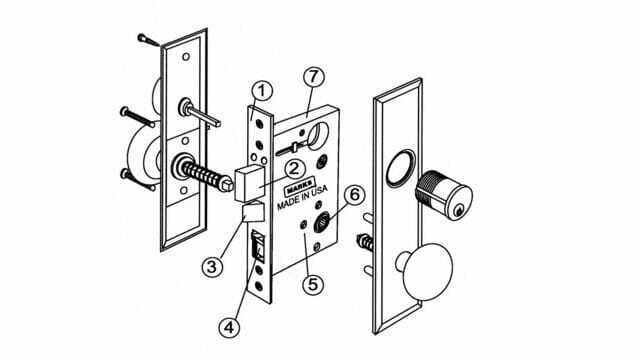 Some mortise locks require specialized tools in order to disassemble and reassemble. Once the lock body is on a smooth surface, carefully removed the cover, making sure no spring loaded parts will fly. I use a piece of spring steel to slide across the inside of the body once I have raised the cover about ¼”. This way, I will almost always find a problem before removing the cover. Once I am satisfied, I will unscrew all of the cover screws, identifying any that are longer or shorter and the holes they were removed from. With the cover removed, I photograph the body at different angles and positions to have a complete record of how the lock was assembled. This way if I forget, I can refresh my memory from the photos. A small laptop or netbook is sufficient to view the images. After the mortise lock has been repaired and tested, I use lithium grease on the parts that slide against the case and a light spray of a dry lubricant. Install the cover and install the lock into the door. Be sure to test the operation of the lock with the door open and closed.